Ditch the chips and lighten up your nachos with roasted cauliflower! Top them with all of your favorite things like beans, rotisserie chicken, pico de gallo, and avocado! These cauliflower nachos make a great appetizer or casual weeknight dinner! Is it just me or are vegetables becoming more and more popular? Even those people who say their not vegetable people seem to coming around to the idea the veggies are pretty OK. Why? Because we are getting creative with how we prepare and season veggies! 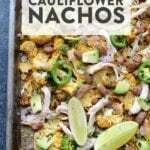 These cauliflower nachos are a perfect example of an out-of-the-box vegetable recipe. 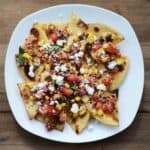 I make these cauliflower nachos as a fun appetizer if guests are coming over or they make a great weekday dinner that your whole household will love. Before we break down the deliciousness of these nachos, let’s talk cauliflower. What temperature do you roast cauliflower at? What temperature you roast cauliflower at depends on what you are preparing. If you are making these cauliflower nachos or roasted cauliflower, the roast temperature is 400ºF. What is cauliflower good for the body? Yes, cauliflower is packed with vitamins and minerals. Cauliflower is a cruciferous vegetable and is high in vitamin B and fiber! Is cauliflower a carb? Yes! In fact, cauliflower is a great vegetable to add to your diet if you are trying to eat low carb. You can replace cauliflower products for high carb products like pasta or rice! 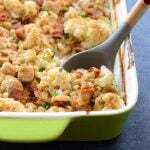 Check out the list of fun and delicious cauliflower products below! Typically, to roast cauliflower, you cut of the cauliflower stalk and then chop the cauliflower florets into small pieces. Today we are slicing the whole cauliflower into cauliflower steak pieces. It doesn’t matter what size cauliflower you use, take your pick! Let’s dive a little deeper into each layer of these cauliflower nachos. After slicing the cauliflower into large steak pieces, we seasoned these bad boys with mostly salt, pepper, and garlic powder. Don’t forget about the cumin and a little bit of chili powder for some heat! Slather them in some olive oil and pop them in the oven at 400ºF for about 25 minutes. BOOM, you got your base. Nacho toppings are the fun part of nacho night at our house! 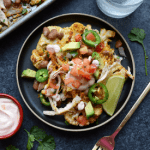 For these cauliflower nachos, we went with rotisserie chicken, cheddar cheese, pinto beans, avocado, jalapeno, pico de gallo, and some red onion. We roasted these cauliflower nachos with the chicken, cheese, and beans. After baking them in the oven, we added the avocado, jalapeno, pico de gallo, and red onion after the baking! Preheat oven to 400ºF and rub a baking sheet with olive oil. Prep cauliflower by cutting the head into fourths. Then, slice into chip-like thin pieces. Place on pan. Drizzle cauliflower with a generous amount of olive oil and then season with garlic powder, chili powder, cumin, salt, and pepper. Bake at 400ºF for 25 minutes. Remove cauliflower and then flip. Add cheddar cheese, rotisserie chicken, pinto beans, red onion, jalapeno, and fresh cilantro. Bake again for 5-10 minutes. Serve with fresh pico de gallo and special sauce!